Medical identification jewelry can save lives by providing first responders critical health information in an emergency. 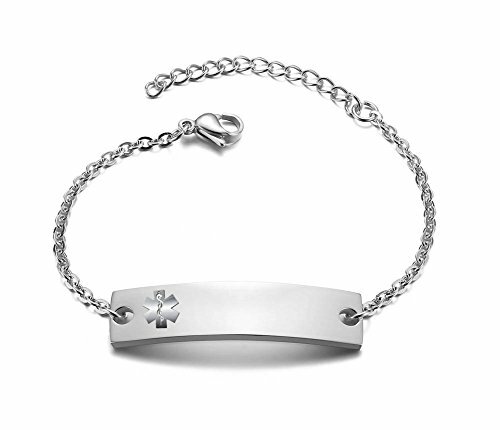 Mealguet Jewelry have a large selection of medical ID jewelry for option. Stainless Steel Bar Style Medical ID Bracelets for Women- ID Tag size: 0.39"x1.5"(10x40mm),length is adjustable from 5.9" to 7.4". It features high polished finish and a heart-shaped lobster clasp. Engrave your emergency medic information on the tag. MATERIAL: Stainless steel is an excellent material, it is durable and practical, does not rust and does not change color.Sturdy and durable. Package included: 1x medical bracelet, 1x wallet medical card,1x velvet bag. IMPORTANT:We offer free engraving for this product. Please click" customize now" fill in your engrave information then "add to cart". We will get your engrave information from your order. If you don't need any engraving please type" NONE". Any questions please contact us. PACKING&AFTER SALES: Comes with grey Velvet bag,Great for Gift giving.Free Medical Wallet card, 30-Days Money back guarantee,100% Secure shopping. Please rate 5 star if you are pleased with our product. If you have any questions about this product by Mealguet Jewlery, contact us by completing and submitting the form below. If you are looking for a specif part number, please include it with your message.